Dance Marathon Involvement: Dance Marathon was introduced to students at the University of Northern Iowa in Fall 2011, and it was that October, after watching some crazy students dancing in the union while wearing orange skin suits, that I signed up as a dancer for the 1st Annual Big Event in February 2012. The following semester, in fall 2012, I was recruited to join the day of committee by a friend of mine already serving on it. I began attending those meetings in September 2012, and in January 2013, the Director of Operations and Director of Entertainment at the time asked me if I would like to coordinate all volunteer efforts for the 2nd Annual Big Event to be held in March 2013. I remained on the Day of Committee for the 3rd Annual Big Event in March 2014, and asked to coordinate the check-in process that year in addition to coordinating volunteers. At the end of March 2014, I interviewed and was selected to serve as the Director of Public Relations for UNI Dance Marathon 2015. I served in this role for one year, coordinating all marketing, public relations, social media, and university relations efforts for all 2014 – 2015 academic year events and the 4th Annual Big Event. Upon deciding to continue my education at UNI, I chose to serve on the community relations committee for the 5th Annual Big Event- working with schools across the state of Iowa to coordinate mini-marathon fundraisers for our organization. In March 2016, I applied, interviewed, and was selected to serve as one of two Executive Co-Directors for UNI Dance Marathon 2017. In this capacity, I was given the opportunity to provide leadership and vision to an Executive Board of 11 Directors, 17 Committee Chairs, a Leadership Team that consisted of 70 individuals, and 10 Committees, that consisted of over 300 committee members. The 6th Annual Big Event held in March 2017, raised over $453,000 for the University of Iowa Stead Family Children’s Hospital. Vorwerk and his Executive Co-Director at the 2017 UNI Dance Marathon event. Omicron Delta Kappa National Honor Society: Inducted in November 2012; President (February 2013 – February 2014); Re-elected President (February-December 2014). Student Admissions Ambassadors: Public Relations Committee Member (December 2012 – March 2014); Vice President of Public Relations (March 2014 – March 2015). Mississippi Valley Caller’s Association (non-profit organization): Public Relations & Marketing Manager from October 2013 – present. theRiver (campus ministry): Leadership Team (August 2013 – May 2015). Campus Activities Board: Homecoming Committee (August 2011 – May 2012). Post-Graduation Plans: My plan post-graduation is to obtain full-time employment working in the higher education field- whether that is in a role directly in an institution of higher education or with an organization that works primarily with students at an institution of higher education. My goal is to one day serve as the President of a university. During the second year of my graduate program at the University of Northern Iowa, I had the privilege of serving as one of the Executive Co-Directors of UNI Dance Marathon 2017. Serving in this capacity, I was afforded the opportunity to lead leaders in accomplishing their tasks and serving in their own roles. While I was proud of the fundraising total that we revealed at the end of our year, I am way more proud of the work that went into this number. 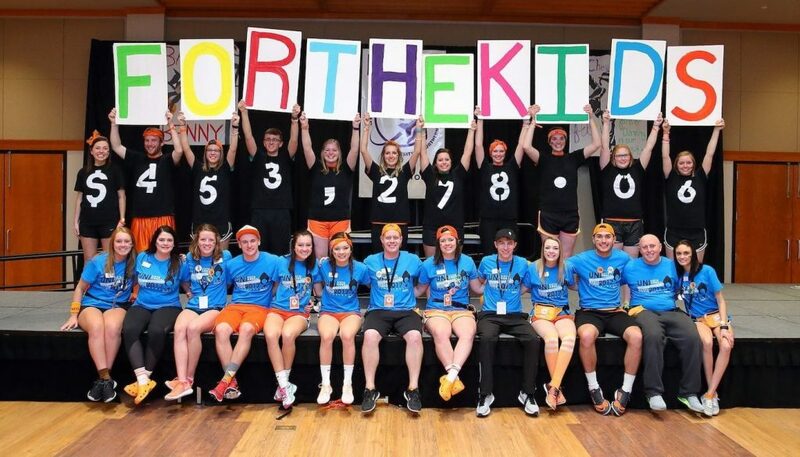 UNI Dance Marathon is nothing without our team of directors, committee chairs, morale captains, and committee members- each and every one of them lived their year for the kids this past year. I am most proud of this as a personal accomplishment because of what I stated earlier- the role I was serving in was a role in which my job was to lead leaders. I am proud of the leadership development that I engaged our teams with and the impact that the training had on how we worked as an organization. I am proud of how that continual training and development motivated our team members, all 300+ of them, to seek to do what is right and what is good for the kids. I am proud that under my leadership, we chose to live every day for the kids. 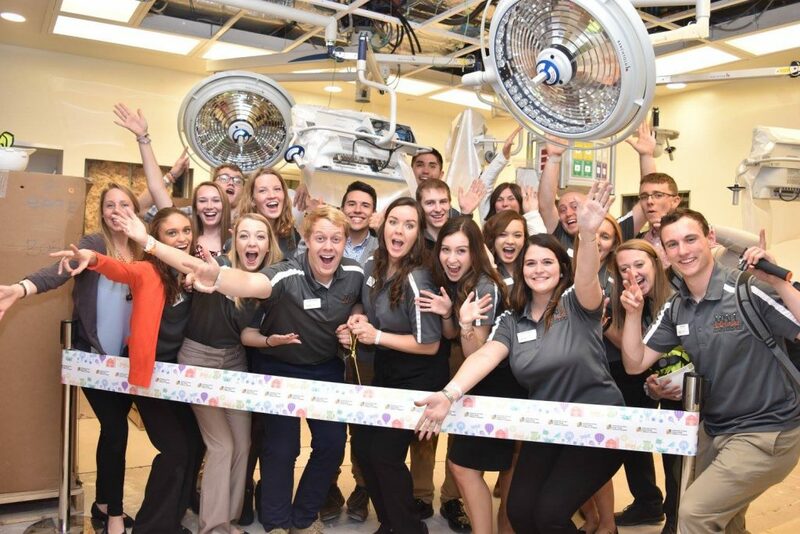 Vorwerk and UNI Dance Marathon student leaders at the opening of the new children’s hospital that their fundraising has helped support. Dance Marathon gave me the confidence to lead others at a young age. As somebody who has always sought out leadership opportunities, because they have always excited me because of the work I got to engage in, I was given numerous opportunities to develop as a student leader that I was able to apply in roles elsewhere on campus. Additionally, I have gained a wide variety of skills serving as a student leader with Dance Marathon that is helping me as I search for full-time employment. I was given the opportunity to plan recruitment and fundraising events, manage a $27,000 budget, provide leadership trainings to different student leaders, present at a national conference, host strategic planning meetings to create a new 3 year organizational strategic plan, and directly supervise other students. These administrative and leadership skills that I was able to develop during my involvement with Dance Marathon have allowed me to become a more well rounded leader and better prepare me for the job search. For many years as an undergraduate student at UNI, I struggled to understand why I do Dance Marathon. So many people had stories of lost loved ones or relatives with kiddos they knew treated for life threatening illnesses. It wasn’t until my senior year while serving as the Director of Public Relations that I finally understood my why. I remember walking up to central campus on a cold and windy October evening, decked out in my orange gear and ready for our annual orange party and recruitment kickoff. When standing smack dab in the middle of the sidewalk stood a girl who I later discovered to be named Abigail- Abi for short as she often reminds me. She looked up to me with her bright blue eyes and missing front tooth and asked me if I would play with her. My heart stopped as I bent down to get to eye level with Abi. She just smiled as she waited for my response but I couldn’t muster up the words to simply say yes because all I could think about was how selfish I was. I had decided to serve as a director that year because it seemed like a natural next step in progressing with the organization as a highly qualified candidate for the position. However, Abi changed everything for me. Abi didn’t care about the responsibilities I had to attend to as the Director of PR. She didn’t care that I had been running late to everything that particular Thursday afternoon. All Abi knew was that she wanted to play and I was the tall (to her) guy who happened to be there at the right time. Abi isn’t the reason I do Dance Marathon because I don’t believe I do Dance Marathon anymore… Abi is, however, the reason that I have chosen to live each and everyday for kiddos just like her. She is the reason that I have chosen to make Dance Marathon a part of my lifestyle, not just an event or an organization that I participate in. I don’t do Dance Marathon because I get to live it everyday for all the kiddos just like Abi. Vorwerk with Abi at the 2017 UNI Dance Marathon event. Students should get involved with Miracle Network Dance Marathon because the organization provides so much more than just an opportunity to dance for a couple hours one weekend a year. 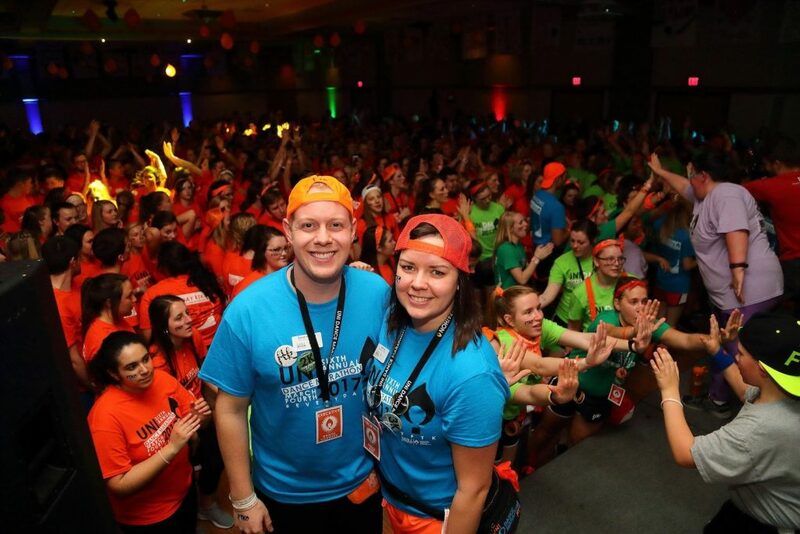 As a movement of students across the country, passionate about the work they do volunteering for the organization, involvement with Miracle Network Dance Marathon can allow students to engage with their community through philanthropic giving while developing their communication skills, leadership skills, and fundraising skills. 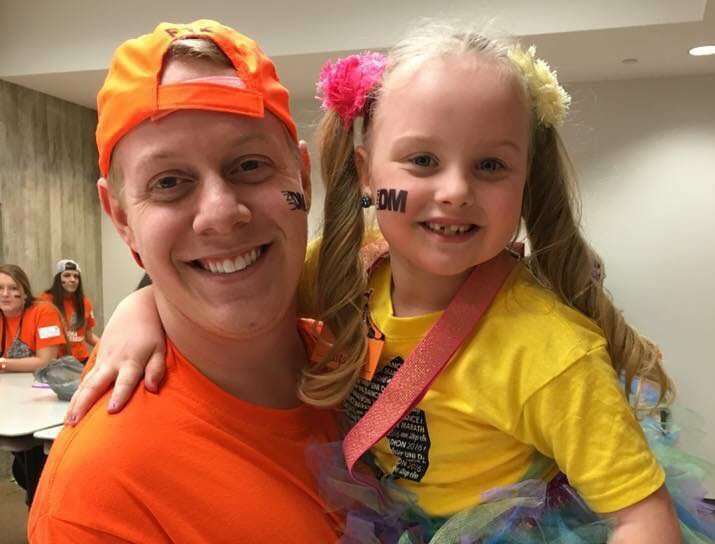 Outside of the professional development side of Miracle Network Dance Marathon, though, is the community that this organization provides to students. The organization provides space for students on individual campuses to connect with other students who are interested in something they are. As a student on any campus across the country, many are seeking to be accepted by their peers and an easy way for them to do so is by joining organizations on their campus where other people are interested in the same things they are. These two aspects, the ability to engage in professional development while still in college and the ability to connect with other peers on campus, are why I believe students should get involved with their Miracle Network Dance Marathon on campus. Community. That is the word that I used to describe a lot of different things this past year. When I presented a concurrent session at Dance Marathon Leadership Conference back in 2016, I had to figure out what made UNI Dance Marathon so unique in our ability to engage dancers year round and that is one of the words I selected to represent what we do at UNI DM- we provide community to our dancers. Community looks different for everybody at different ages and stages in their lives but I think anybody can articulate what their community looked like growing up- that physical environment, neighborhood, or town where you lived. I believe people should donate to their local Children’s Miracle Network Hospitals because of how powerful the word local is in describing their Children’s Miracle Network Hospitals. People should donate because this is their local hospital- it’s not just some random organization on TV asking for a donation but a local hospital, a part of their community. Children’s Miracle Network Hospitals provide world-class treatment to the kiddos in everybody’s community. While not every person may know somebody treated there, the sheer fact that a hospital exists in communities across the country that provide treatment to local kiddos is why people should donate. UNI Dance Marathon student leaders with their 2017 fundraising total benefitting the University of Iowa Stead Family Children’s Hospital.